As a child, I was picky with my food. Veggies were out, anything with chunks, anything green – I wouldn’t eat. So when my mother insisted on making a healthy meal of Cabbage Rolls in her Crock-Pot at around age 8, I immediately turned my nose up. Stews and vegetable soup? No frickin’ way was I going near it. From about that time, I always associated her oh-so-80s Crock-Pot with limp, overcooked vegetables and chunky soups – and even though I quite like chunky soups now, I was a little dubious about the slow-cooking machine. As I understand it, the Crock-Pot was more of an American thing – and while they’re trying to make a comeback over there, they’re trying make somewhat of a debit over here. Their PR team got in touch with me ages ago to try a Crock-Pot review. They sent a lovely box of veggies, which I immediately knew I probably wasn’t going to use. I had a Eureka moment instead. 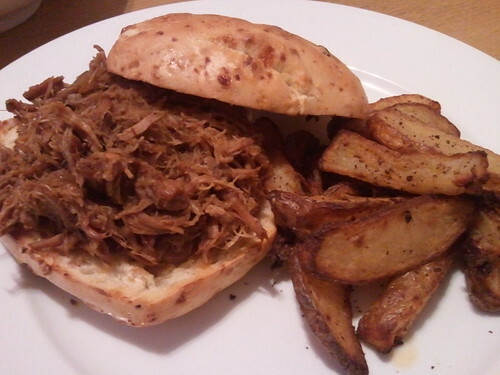 What better way to bring the Crock-Pot to the UK than to slow-cook a delicious American classic: Pulled Pork. I was inspired from a few different recipes online, but for the most part, this concoction was all mine. Most of you know that I’m far from an expert in the kitchen (having things cooked for you can be so much more reliable! ), but I have to say this one is a winner. Please note, that as an American, I still have my American measuring cups. I love them, and I still think that way, so most of this recipe (bar the pork) reflects that. Add all ingredients into the pot. Turn on the lowest setting, wait 8 hours and then shred the pork with a fork. That’s it. I can not tell you how delicious and easy to make this was. 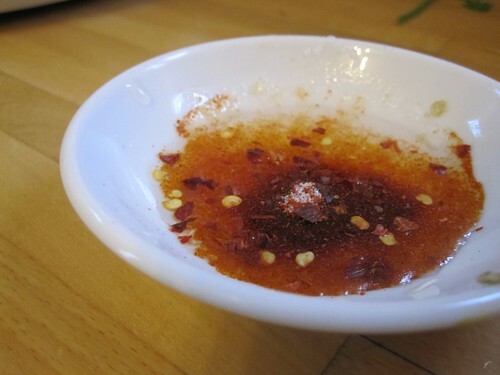 Spicy, sweet and fantastically tender. The only downside is that next time I make them, I’ll have to wait another 8 hours to eat them. 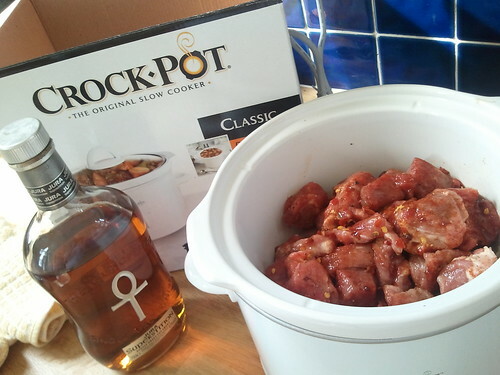 Welcome back, Crock-Pot, I imagine you will go far. 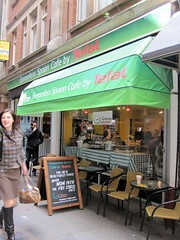 I was recently invited by the nice people who represent Tefal to the Greaseless Spoon cafe – a pop restaurant that is currently touring the UK. 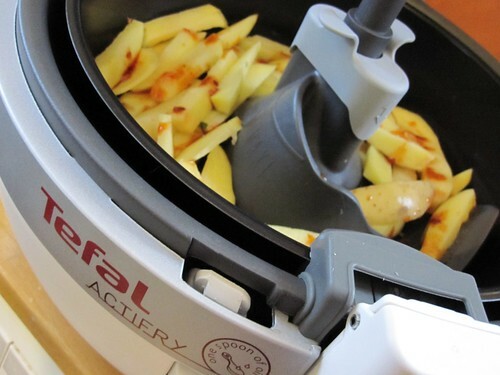 The cafe features food that is prepared by Tefal Nutritious and Delicious products, including the Acti-Fry, a futuristic looking machine that claims to make chips that taste like actual fried chips, but with only 3% fat. Normally, if I want ‘healthy chips’ I just cut up a potato sprinkle the pieces with a bit oil and paprika and pop them in the oven. Usually they come out ‘just ok’, but they do the trick. 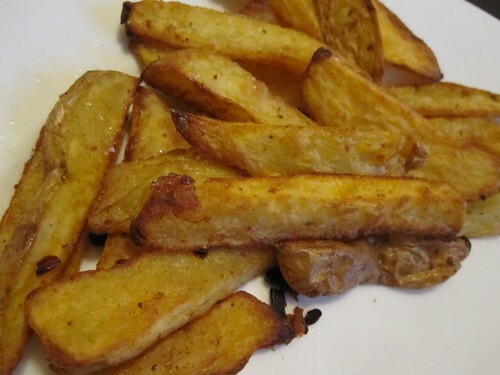 Face it though, oven chips are by no means regular chips. I was sceptical the Acti-Fry would be all that it was cracked up to be. After going to the Greaseless Spoon, I was thinking my suspicions were correct. The chips and sausages I had that were cooked in the machine were just a bit too soggy for my taste. A lot of other people told me it shouldn’t be the case, so I was happy when I was given the opportunity to try the Acti-Fry out for myself at home. It was also welcomed because following my holiday in Turkey (which was amazing, thanks very much), I’ve been on a diet – and when I’m on a diet, I always crave bad-for-me things like chips. And you know what? After careful testing, I can officially say that the Acti-Fry a [expletive deleted] amazing machine. I am officially in love. One potato weighing in at 150g, a quarter tablespoon of groundnut oil with paprika, red chilli flakes and 20 minutes in the Acti-Fry produced nice crispy chips comes in at under 150 calories – all at the push of a button. If I hadn’t made it myself, I would have thought they came from a takeaway. So yes, thumbs up for the Acti-Fry. It’s a pricey at a suggested retail price of £199.99, but Tesco is selling it for £174, and rumour has it you can get it at Costco for £99. I’d say it’s definitely worth the £99, but in all honesty £200 is a bit steep. Still, if you have the money, it’s totally worth it.